Making learning targets clear and sharing them with students is fundamental to good teaching. Students who understand what the learning is about are more engaged and better focused on the learning (as opposed to the activity or the grade) than those students who are not clear about the goal or target for the learning. "I make it a habit to share the learning targets with students." 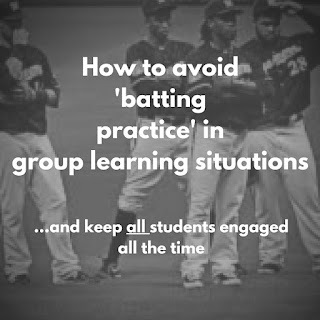 Sharing the learning target must become a reflex, a habitual practice. As teachers, we should feel uncomfortable with proceeding with the lesson until we have posted (at least in secondary classes) and shared the learning target. There is room for variety in this, of course, but the principle is foundational: learning targets need to be shared with students. In elementary classrooms it may look different depending on the abilities of the students and the subject. In secondary classrooms, however, it will probably mean writing the LTs on the board and making sure students understand them before engaging in the lesson.